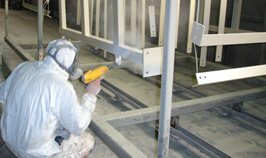 Pro-Tect Coatings offer a range of powder coating systems to suit all kinds of environments from mild to extreme, and a huge choice of cosmetic powder finishes to satisfy your personal requirements. We operate a large curing oven and provide a professional powder coating service to the fabrication industry throughout Kent, London and South East England. Powder can be applied to mild steel and aluminium and is capable of withstanding extreme environments. It can also be used over galvanized steel but this tends to leave a rough, not very attractive finish. In our opinion a far superior finish is achieved over hot zinc spray which is an excellent alternative to galvanizing providing a uniform flat/smooth surface for the powder coating to adhere to with no fettling of sharp edges and runs, no pinholes and no distortion.